Once upon a time there was a small 8 lb. chihuahua/rat terrier cross named Princessa who was the princess of the house. She sat on the back of the couch and probably ate bon-bons. Then one day on November 6, 2010 while on a big trip to a semi-rural Super Walmart in Pewaukee, Wisconsin she managed to slip out of the car and she was off! She had a collar and tags, and was a friendly little girl, but that big parking lot and all those cars must have been scary; even for a Princess, because she ran into a residential subdivision, and vanished. The owner contacted Lost Dogs of Wisconsin, we posted her, and she was reported missing to all the correct places. But still nothing. Nobody had seen her and the worst was feared. But what we have learned is that the worst seldom happens. 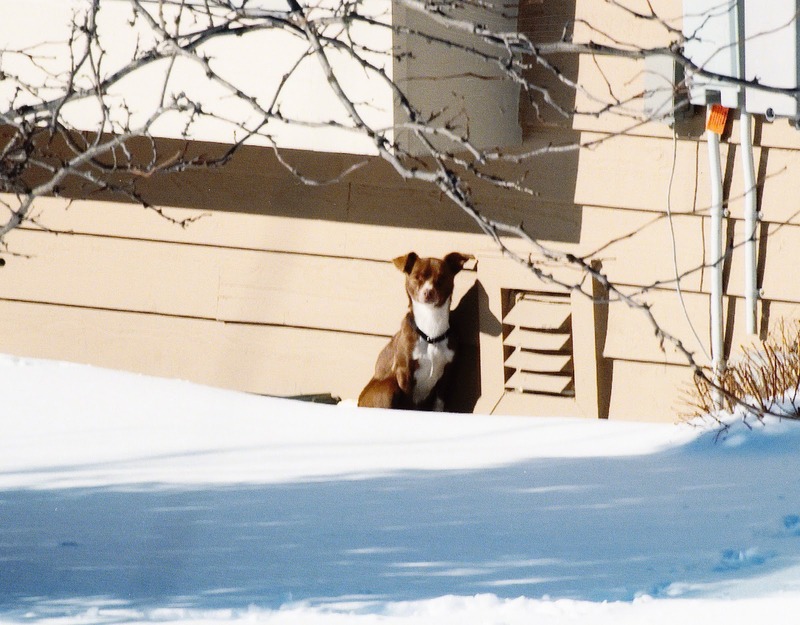 Coyotes are not lurking behind every bush; dog fighters are not waiting to scoop up lost dogs and use them for bait dogs; and lost dogs are usually way too resourceful to starve or freeze to death. We have learned that many owners give up far too early and because of this our shelters are overcrowded with “strays” which are in reality – lost pets. Helping educate owners on effective methods to recover their lost pets is a large part of the No Kill Equation. Why try to find a new home for that “stray” when it has a perfectly good home already? There are far needier animals in need of shelter space and new homes. So back to Princessa’s story. We still had nothing to go on. Until one day early in December, we had a call that a small brown dog was hanging out behind the Thunder Bay Grille just off of I-94, a great restaurant with a fine menu. It was only about 3 miles from the Walmart, so we knew it was possible for it to be Princessa. We took a live trap over thinking this was going to be an easy catch. Well, it was not. Why eat rotisserie chicken in the trap when you can have prime rib at the dumpster? Some nights she almost went in, reaching with her long beautiful Princess neck just over the trip plate. Some nights she snubbed us completely – “You expect me to eat that?” We offered her everything we could think of – delicious concoctions provided by our volunteers. The Christmas season came and along with it all the holiday parties at the restaurant, with large trays of lovely offerings – lots of which missed the dumpster and became a doggy smorgasbord. On bitterly cold nights we had to close the trap for fear that she would be caught too long and freeze. But no worries there – she wasn’t going in. We tried big traps, small traps, covered traps, cozy traps, traps fit for a Princess. Christmas and New Year’s came and went. The Thunder Bay Princess became the Thunder Bay Devil Dog in my mind. I’d lie awake at nights and dream up ways to catch her. My husband, an engineer, tinkered with the traps and came up with a double catch method. Other Lost Dogs members and myself would spend hours on the phone or over coffee scheming. I think we were getting crazed looks in our eyes – kind of like Bill Murray in Caddyshack trying to catch the gopher. 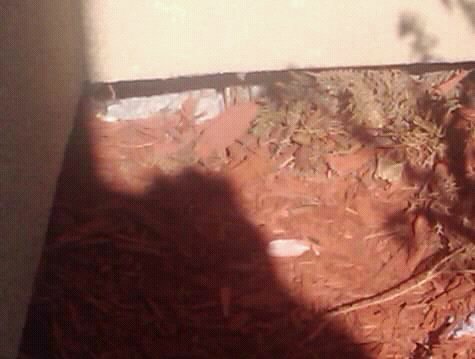 She lived in a hole under the porch at the restaurant, but was seldom seen. Only her tiny footprints in the snow showed us her daily whereabouts. Then one day in mid January – she was gone again. A worrisome couple of weeks. Why would she give up the restaurant food? Was she concerned about her waistline and her high fat/low fiber diet? Looking for a new kingdom to conquer? Luckily a phone call from a neighboring condominium subdivision came in – just when we were beginning to think we’d completely lost track of her and were back to square one. The caller said a fat brown, sausagey looking dog with short legs was seen running across the patio. Late January. More blizzards, bitterly cold weather and very deep snow. A sighting here, a sighting there. She was now the Princess of Avondale and Stillwater, two very nice, spacious condo subdivisions with a lot of green space, plenty of birdseed, and endless decks and sunrooms to crawl under for shelter. An upscale neighborhood with a regular garbage day – what more could a Princess want? So here a trap, there a trap, everywhere a trap, trap. But only an angry possum. Never a Princess in a trap. February came and went. The snow started to melt. Princessa was a busy girl. One day I saw her – her coat glistening in the sun. I made a note to add more sunflower seeds to my diet. Sometime in February she lost her collar. The residents were wonderful. They called with every sighting. They helped man the feeding station and the trap. One resident that was helping us took this picture, as she warmed herself by a vent on the side of a condo. She was now very comfortable in this quiet neighborhood and would be seen five or ten times a day. Our phones were busy, but our trap was not. March arrives. The snow starts to melt and the Princess is enjoying rolling on bare patches of grass in the sunshine. And suddenly a bunch of us had the same idea at the same time. Maybe we just needed a bigger trap! The snow had melted away from the gates of the tennis court. The wonderful Avondale property manager opened it up for us and offered to keep her food bowl filled. He moved it progressively into the tennis court – a little bit at a time, so she didn’t get suspicious of our plan. I was envisioning tennis players in August having to jump a small, fat dog as they dove for the ball. But – thankfully, it didn’t take that long. On March 10th we got the call. A lady walking by had seen her in the tennis courts eating from her bowl and had snuck up and shut the gate. And so the story of the Pewaukee Princess came to an extremely happy ending. No frostbite, no medical problems. An 8 lb dog that lived outside for four months through a brutally cold Wisconsin winter. She spent a few days in rehabilitation with one of our Lost Dogs of Wisconsin volunteers, Kathie D; but then came right back around to being a Couch and Lap Princess. 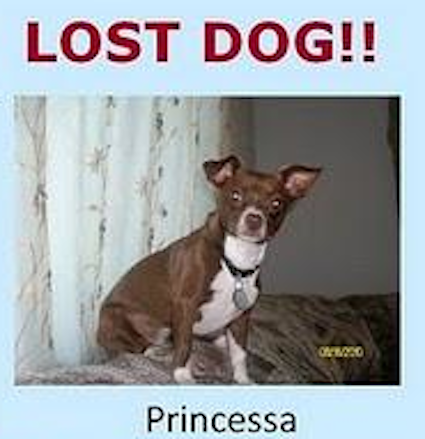 Princessa gave us memories to last a lifetime plus another success story to encourage owners of lost dogs to Never, Ever Give Up. A huge thank you to the residents and management of the Avondale and Stillwater condominium subdivisions, the staff and management at the Thunder Bay Grille, the Mobil station, the Machine Shed restaurant and the Radisson hotel; the staff at the AT&T building; BREW Midwest for the loan of a trap; Mark H at HAWS; and to the wonderful members of Lost Dogs of Wisconsin – Carlene and Becca H, Kathie D, Larry D, Susan T and Carol S, and my husband, all of whom manned the trap, delivered flyers, concocted wild schemes, and commiserated with me during the entire process.